Combat-corvette with adequate role-play interior; standard-armor with advanced-armor plating. 1. 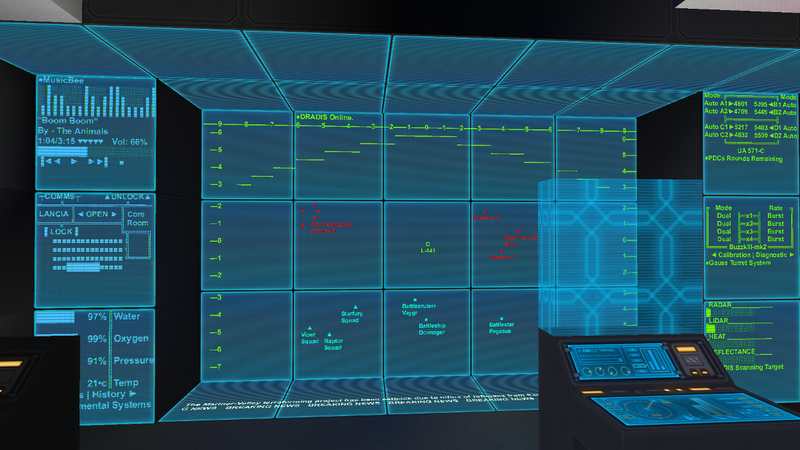 Stand in front of the “Core-room display” to access the core room. 2. Tweak the ship thruster to your preference. 3. Since the turrets are mounted on the rear, they’ve a forward range-deficit. 4. The main-turrets will aim very awkwardly but their accuracy should be fine, its just how Starmade is at the moment. Kraengis, Thadius Faran, Lord Daro and 9 others like this. I saw that if you add just a Cannon computer and attach the cannon turret you have to it it'll track targets correctly. I dunno why it works but I saw it on JW608's Youtube channel, thought I'd pass the info on. I just downloaded it and I'll check if that fixes it for ya. Also I loved the core room design so I just HAD to add this to my fleet! Thanks for that, I did some testing & can confirm that CC turrets resolves the awkward tracking almost completely. I’ve PM schema, he's too busy working on the universe-update at the moment so its on his do to list. For now I will just leave the blueprint as it is. M+M stealth bomber for pilots.